Resilience is the ability to spring back quickly from difficulties. Resilience planning looks at how communities, institutions, businesses, and homeowners can recover quickly from natural disasters. It looks at how strong buildings have to be and how to insure that basic services continue to be provided. It sets out to balance of the needs of the here and now with the exceptional circumstance of a disaster. It can also enhance sustainability efforts since many of the same strategies take on added importance when viewed through the lens of resilience. Resilience is a way to ensure that the hard earned efforts of today can continue into the future. 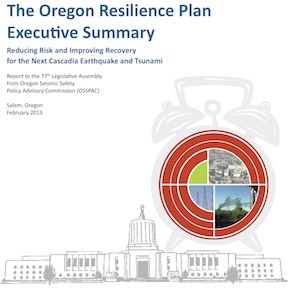 As the Oregon Legislature looks to adopt some initial recommendations from the Oregon Resilience Plan (ORP), the Beaverton School District is starting to see how the ORP will affect the design of schools and their relationship to the surrounding communities. Jay worked with SEFT Consulting to develop resilience standards for the first of their two new schools. For more than 20 years Jay has provided architectural services and developed expertise in residential architecture, small scale commercial projects, and historic preservation. His projects include a number of houses on the Oregon coast, where he gained a keen understanding of designing for coastal conditions. His historic preservation projects includes work on a number of listed as historic buildings, such as the Barbey Maritime Center, the Hotel Elliott in Astoria, and the Day Building in the Alphabet District in Portland. He is experienced in working through the review and approval process of local historic landmarks commissions, and has the knowledge necessary to maximize state and federal tax credit opportunities.